"No clew has yet been discovered to the whereabouts of the jewels and other property stolen from the bathhouses of Mr. & Mrs. Percy D. Haughton at Gould Island and their guests. Detectives are here from Boston and New York to investigate this." Off Conanicut Island's eastern shore lies Gould Island, the third of the major islands that comprise the town of Jamestown. It was named for Thomas Gould, who purchased the island in 1657 to use as farmland. In 1858, the Maitland family bought the entire island. After 12 years, they sold it to the Homan family, also from New York, who had the esteemed architecture firm of McKim, Mead and White design them a "cottage." During the summer of 1911, coming off their national championship, Harvard’s football team could be seen practicing on Gould Island. Harvard’s football coach, Percy D. Haughton and his wife Gwendolyn now owned the island and a Boston paper reported that the team routinely exercised there. Following the trends of the summer social scene at Newport, entertaining was part of the Jamestown lifestyle. The Haughtons were the last private citizens to own Gould Island. With the threat of war looming, Congress authorized the seizure of land along the eastern seaboard. Torpedoes were being developed on nearby Goat Island and a more remote place was needed for storage and testing. In September 1918, the government notified Mrs. Haughton that Gould Island was being requisitioned--they had 30 days to vacate. In 1919, construction of hangars for seaplanes and concrete piers began. The Haughton's home became barracks for marines. Throughout the 1940s, torpedo guidance systems were tested at Gould Island. Torpedoes launched from the firing piers were followed by aircraft tasked with tracking them for retrieval. No system is perfect though, and Jamestown residents distinctively remember hearing torpedoes come up on the rocks. Camp Seaside's pier had a large warning light, which lit up when a torpedo was fired, giving swimmers time to get out of the water. 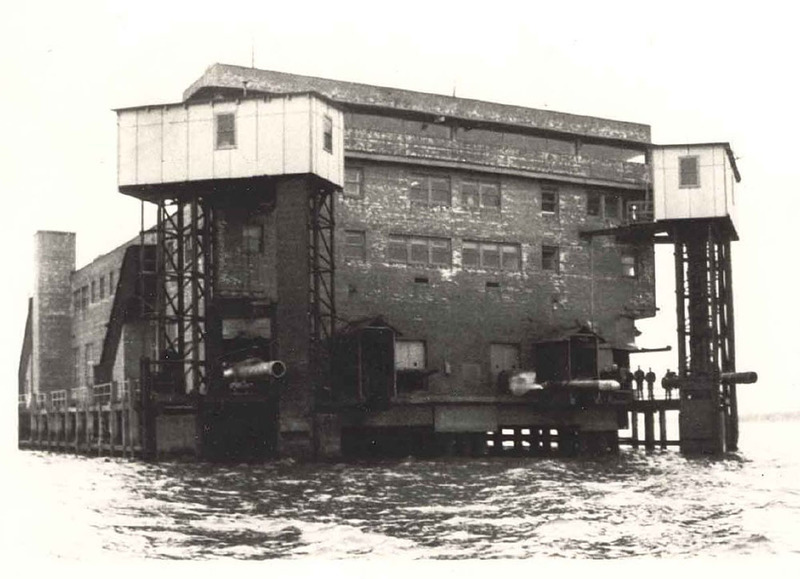 Although four of Gould Island's building were declared "historic" and worthy of preservation in 1975, the Navy demolished everything but the firing pier in 1999. Currently, the island is managed by The Department of Environmental Management (DEM) as a conservation habitat. It is scheduled for an environmental study to asses the viability of future development. 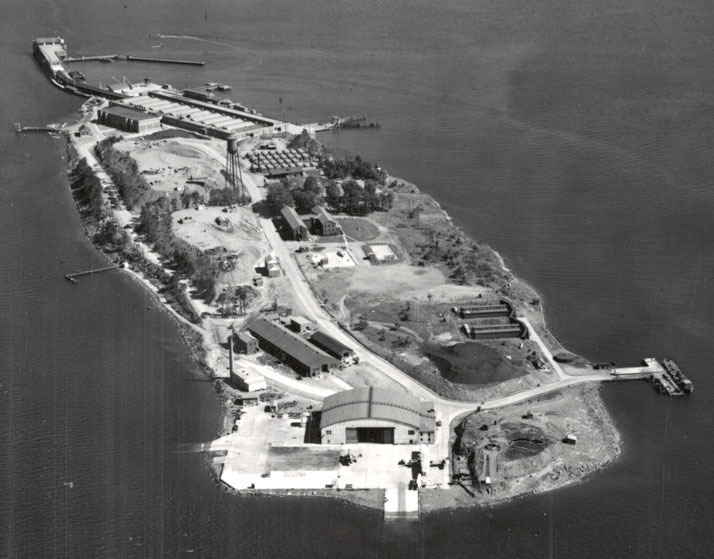 Aerial view of Gould Island, c. 1944: By 1942, to keep up with the war effort, intensive work began on new buildings at the north end of the island. A new marine barracks was built next to the ferry slip and the former Haughton home was finally demolished. For Sale: The Homan House on Gould Island, 1907: Advertised in the March 1907 issue of "Country Life in America", the entirety of Gould Island was for sale, including outbuildings and the prestigious home. 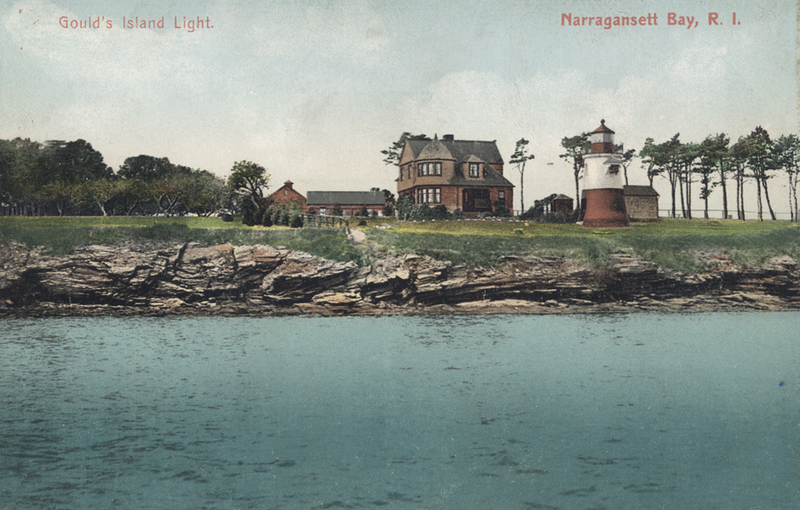 Gould Island Lighthouse, c. 1900: In 1889, Francis Homan sold a half-acre lot to the government for a new lighthouse and the light-keeper's cottage. The price? $2,500. The lighthouse was in operation for 58 years and razed in 1960. Firing Pier on Gould Island, 1944: Located on the north end of the island, each torpedo guidance system was tested by shooting the torpedo from the firing pier. Most torpedoes were fired north toward Prudence Island. 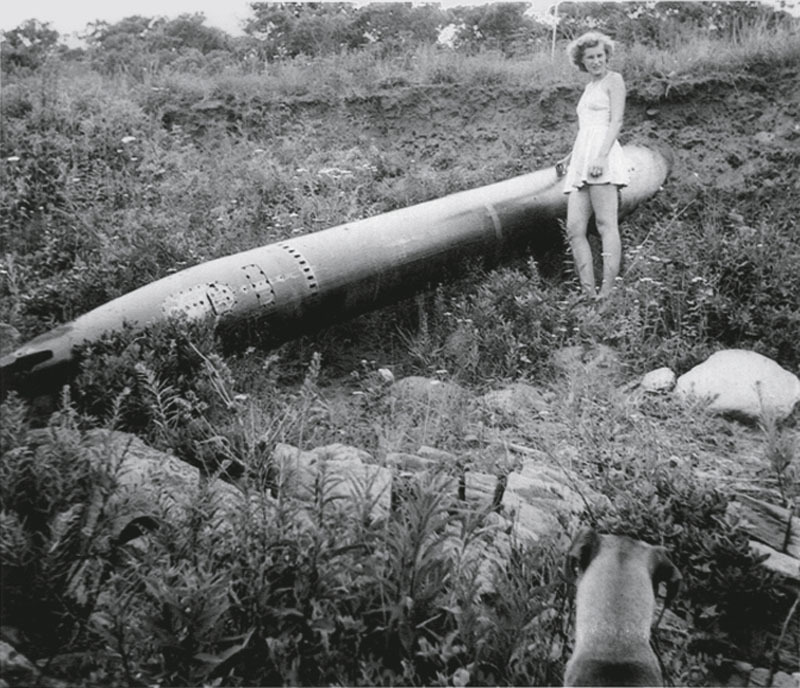 Jamestown Resident Mary Miner Finds a Torpedo, 1944: Thousands of torpedoes were tested from the firing pier during the war; not all torpedoes were recovered. Some sank into the seabed and others ran aground on shore. Learn more about Gould Island's Lighthouse here. Read the Jamestown Press to learn about new initiatives for Gould Island. 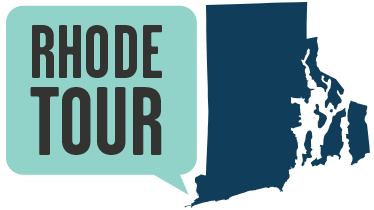 Jamestown Historical Society, “Summer Cottages and Torpedoes,” Rhode Tour, accessed April 21, 2019, http://rhodetour.org/items/show/292. A Military History of Narragansett Bay, Feb., 2018, Brian L. Wallin, "41°N: Rhode Island's Ocean & Coastal Magazine." Gould Island: Scuttape to Bird Sanctuary, January, 2018 Rosemary Enright & Sue Maden, article, Jamestown Press. “Torpedo Range” Island: Gould Island, Narragansett Bay in the Second World War, Anthony S. Nicolosi, Fall, 2004, Journal of the Newport Historical Society.